A parcel arrived from my Secret Pal! Superhero Pez – Batman, Spider-Man and Wonder Woman. 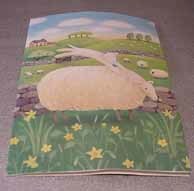 and this delightful sheep card! Thank you Secret pal for the incredibly thoughtful gifts! I especially love and appreciate the pink Squiggle which you knew I had a hankering for! I think I’ll combine it with either some pink eyelash or some Rowan kid mohair to make a scarf. Haven’t made up my mind yet. I’ve been busy knitting and have finished the sleeves on the top down raglan. It took a bit longer because I decided to frog part of one sleeve so that the stripes would match up a bit more. I’d thought that I could live with mismatched stripes but because it would have been the only part of the sweater to not match it would have really annoyed me. My current knitting project is a secret project! But something that’s very near the finishing line is my Mango Moon Poncho. Here’s a photo I took earlier of it mid seaming on my messy craft room desk. It’s now all sewn up and just needs ends to be woven in. I was thinking of ordering a Mango Moon Sweater kit but after trying the poncho on I was aware of the heaviness of recycled silk. I’m not sure how I’d feel about a cardi or something in it. The last few weeks have been all about cleaning, tidying up and sewing. Andy turned 40 last Monday so the weekend just before that we went out with some of his friends for a meal at the Japanese noodle bar. Three of his friends were staying with us hence the tidy up! His frock coat turned out to be a bit more difficult to sew than I thought it would be. It’s now about 99.5% finished but something went wrong with my sewing machine the other week – it started to try and eat the coat! – so it’s temporarily on hiatus until I fix things. In the meantime I’ve been stuck on Sleeve Island. I’m going to make Klaralund at some point but decided to finish off my Silk garden top down raglan before that. My aim is to get the sleeves done before I finish the body of the cardigan. Then I’ll be able to see just how much yarn I have left for the body. The sleeves do seem a bit large. When I next make a top-down raglan I’ll start my sleeve decreases a bit earlier. I have some Colinette Skye in Fire which is going to become a v-neck td raglan. I’m thinking of finishing it with a black eyelash trim. In other news I’ve begun obsessing with the idea of owning a yarn store. Yes, it’s a common knitters’ dream and who knows if it would ever become a reality. The only thing is that next year Cardiff loses its primary yarn supplier. Once David Morgan closes down there will be no local place to get good yarn like Rowan. The only alternatives will be a couple of hours away in Swansea (Mrs Mac’s) or Bristol (John Lewis). Or Carmarthen if you go to ColourWay. Ah well, not long now until The Knitting and Stitching Show in London plus the annual trip to San Francisco next month! I Have The Greatest Friends! Two balls of Diadomina by Diakeito in shade 312! A present from Theresa! It’s 50% wool, 21% mohair and 29% nylon. It’s like some of the Noro yarns in that’s it’s self striping but it’s very different from the Noro yarns that I’ve used. The mohair adds a certain luminosity to the colours in the yarn. Thanks Theresa! What a fab surprise! I’m not sure yet what to make from this. 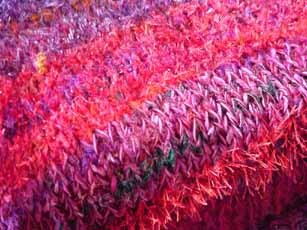 My first instinct is a scarf or something else small but I also like the idea of including it in a larger garment like a cardi or poncho with a co-ordinating solid yarn. Included in the parcel was a note on this wonderful lemming paper! I’ve just cast off the Squiggle and Fizz scarf. It’s a very quick project but not something that you could work on during the dark! 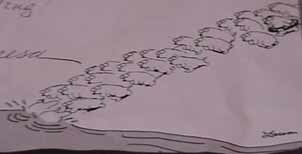 You really have to keep an eye on the two yarns. I finished with about two yards of Squiggle and I think a third of the ball of Fizz left. There’s certainly enough of the Fizz to add a trim to a bag or the top of a pair of Fuzzy Feet. My pair of Fuzzy Feet are quite close to the top of my must finish pile. It’s been quite rewarding to finish some projects recently. 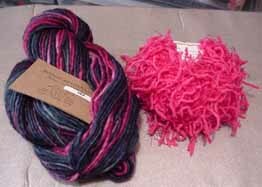 I’ve picked my Noro Silk Garden top-down raglan and hope to work on that after I finish Andy’s Velvet Birthday Coat. 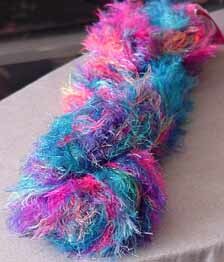 My next bus and lunchtime project will be another scarf made from Crystal Palace yarns – this one from Splash and Fizz. I’ll probably cast on fewer stitches than in the pattern though and I’ll also knit the two yarns together throughout the scarf rather than by themselves for some rows. While they’re not always the easiest things to knit with, I do love novelty yarns. 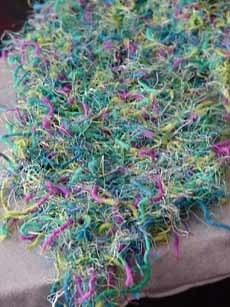 Here’s the latest pic of my Squiggle and Fizz scarf made from this pattern. I’m using Fizz shade 7223 Seaform and shade 9289 Cool Jazz of Squiggle. The scarf is a lot more green than I would usually wear but I think it will look fun with a black jacket. I had a nice knitting mail hall today including this skein of Colinette’s SilkyChic in Jamboree which I bought on eBay. I’ve always liked this colourway but the colours can vary in the shade. I prefer it like this with lots of that wonderful turquoise blue, but some dye lots have had lots of yellow/orange in them in them instead which I’m not keen on. I’ve now wound it into a center pull ball and can’t wait to knit a fab scarf from it. You can never have too many scarves! The yarn does feel very silky, it will be interesting to see how it holds up to continued wearing. Also in the haul was a copy of Cornelia Tuttle Hamilton’s Noro Collection Book Number Two. I have ten balls of Silk Garden waiting to be turned into Klaralund. This also means that I can now join the Klaralund-Along! 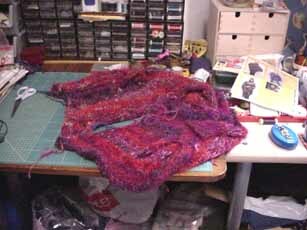 And here is a pic of the first piece of the Mango Moon poncho with red, purple and pink accent yarns. Oh, I’ve joined Secret Pal 3 and have already had an email from my Secret Pal! How exciting!